Sending your child off to camp for the summer can be nerve-wracking. It may make you especially anxious if you have a child that struggles socially. Even if you’ve followed all our advice on picking out the right camp and equipping your child with the social skills he will need for it, you might still have concerns about what lays ahead. You may wonder how the new environment will affect his/her behavior, if it’ll be tough to make friends with so many new faces, and if he’ll end up getting into trouble with the counselors. Concerns like this can put a damper on the summer, creating stress for both you and for your child. That’s why it’s best to address them early on, and let the summer be all about fun and relaxation. 1. What the camp has to offer. 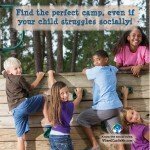 For children who struggle socially, the thought of starting summer camp can be a source of stress. If you’re anxious about sending him off, your child will pick up on that and begin to feel it too. That’s why it’s important to discuss the ways your child can benefit from the experience. 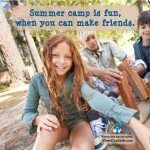 Hopefully, you used my 5 tips for finding the perfect summer camp, and asked for your child’s input before choosing the camp. If you did, now is the time to remind him why you chose this camp, and which activities he was excited about at the time you signed him up. Whatever it is that drew you both to the camp, it’s a good idea to talk about those things one last time before the summer begins. Even if your child is still a little anxious about the first day, he will feel better thinking about all the good things he has to look forward to. 2. What is Expected from Campers. By now, you probably have a pretty good idea about the camp’s philosophy, values, and goals. This will give you an understanding of the types of behaviors that are and are not okay when your child is there. For example, if this is a camp that encourages a friendly, non-competitive environment, your child should know that gloating and bragging will hurt him socially. 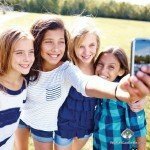 If you’ve had a chance to review the four social skills your child will need at camp, you know that there are certain tendencies that can get in the way of your child making friends in his camp group. Addressing these habits and talking about the camp’s expectations is important in order for your child’s summer to run more smoothly. 3. How the Day is Structured. Knowing what to expect can make a huge difference in your child’s experience. As with all things in life, the unknown can be a source of anxiety for a summer at camp. Find out as much as you can about the daily schedule, and try and get hold of a copy if you can. Then take some time to look over it with your child. This will give him a chance to get used to the idea of activities he may not be initially excited about, and of which activities he can look forward to. It will also give you an idea of whether any changes or modifications to activities should be discussed with the camp’s directors beforehand. 4. Who is There to Help. Make sure your child knows who he can look to for support if any social or bullying issues come up. Some camps may want these issues discussed with the group’s leaders, while others may assign counselors to keep an eye on this sort of thing. Even though your child hopefully won’t need to use this information, there is comfort in knowing that there is someone there to help if problems come up. You can reduce the likelihood of any social drama by making sure your child knows the social rules before the summer gets under way. 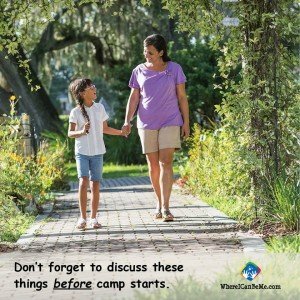 Remember, how you talk to your child will make a big difference in how he feels about starting camp this summer. If you’re anxious, he’ll be anxious. That’s why it’s best to get all your questions answered by the camp first, so that you’ll be able to speak calmly and confidently with your child about what to expect this summer. If you or your child still has concerns after talking it over, you may want to consult with a qualified speech language pathologist about the benefits of a social skills program prior to the start of camp. By knowing what resources are available to you and using them, you can help make sure this summer gives your child a chance to have a great time and unwind from the demands of the school year.